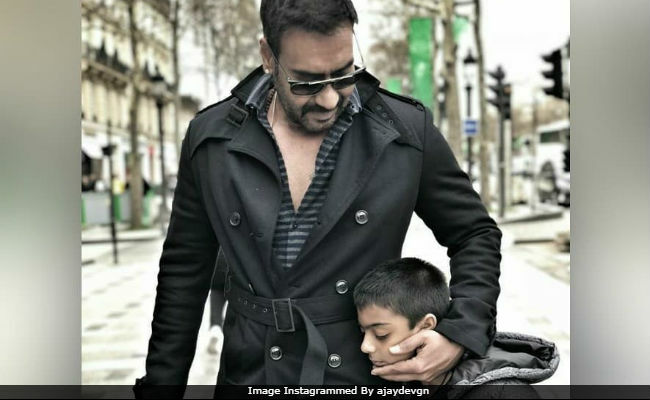 Actor Ajay Devgn, who is currently holidaying in Paris with wife Kajol and children, was apparently trolled for smoking next to his son Yug. Ajay Devgn had posted a picture with Yug earlier this week and in it, he is seen holding a cigarette in his right hand. Yug stands next to him. The comments appeared to be deleted now but several media reports have posted screenshots of the messages. "Ajay Devgn, wish you a very happy birthday, but cigarette smoking is injurious to health" and "Smoking right next to your kid? You can do better than this Ajay" were some of the comments posted on the picture, reports Spotboye. The picture was posted by Ajay Devgn on his birthday. He turned 49 on April 2. He had shared two pictures of Yug (one with him and the other featured Yug with a bag full of chocolates) and captioned them as, "Before and after." Here's the picture for which Ajay Devgn was trolled for. Ajay Devgn, Kajol, Yug and the couple's daughter Nysa left Mumbai on Sunday. In Paris, they were joined by Vatsal Sheth and his wife Ishita Dutta. Both of them have worked with the Golmaal Again actor previously. Ajay Devgn and Kajol married in 1999. Their daughter Nysa, 14, studies in Singapore while Yug, 6, stays with them in Mumbai. Last week, Ajay Devgn's Raid co-star Ileana D'Cruz told news agency IANS that he's 'obsessed with his kids.' "He's a massive family man. He's obsessed with his kids, which is very lovely. He's really a positive person. When you are working with likeminded people then there are no pretences. So, it's nice working with him." Ajay Devgn has Total Dhamaal, Sons of Sardaar and a film with Tabu in the line-up. He is also producing Kajol's Eela.